The Mattel DC Superheroes toy line is geared at children under the age of 7. They’re simple toys with only a handful of features and overly-stylized, simplified characteristics. Yet, these toys are still well-made and worth paying attention to. After all, for many children, these toys are their introduction not only to action figures and the more serious toys (assuming that isn’t a huge oxymoron) they’ll be playing with later on, but also the characters and iconography of modern mythology; namely comic book superheroes. The Green Lantern is part of an intergalactic police force known as the Green Lantern Corps. As such, there have been several Green Lanterns (including Guy Gardner who was big in the 1990s and John Stewart from the Justice League animated series). However, Hal Jordan is the one most people usually think of when you say ‘Green Lantern’. Like many DC superheroes, he’s incredibly brave, resourceful, intelligent, physically near-perfect, etc. Apparently DC Comics didn’t discover faults until sometime around the 1970s or 1980s. But an obvious pro-Marvel bias aside, the Green Lantern evolved into a very unique and interesting character. The Green Lantern Ring gives Hal Jordan the ability to manifest a wide variety of powers and abilities, as well as the ability to make tangible objects out of thin air. Sometimes, there’s some overlap (such as why would a man who can fly at super-sonic speeds need to manifest a jet? ), but for a seven-year-old, that simply doesn’t matter. Green Lantern is Batman’s friend and ally and he comes equipped with a cool jet that shoots rockets. Because of course he does. Scoring the appearance of toys like this is difficult because since it’s a kids’ toy, realism deliberately takes a backseat. Many even basic features are left out in favor of having very simplified characteristics of both objects and characters. This means that the figures are very simple and very basic in their appearance. But it again needs to be noted that this is intentional. Green Lantern is lacking some details (since this is clearly Hal Jordan, where are the white stripes on his otherwise brown hair?) but is gifted with others (his mask and ring aren’t just painted on, they’re individually constructed). The ring itself even has the Green Lantern symbol built into it. On such a small figure, that’s some serious attention to detail! The jet, on the other hand, is made up almost entirely of see-through green plastic that is cheap sunglasses’ level of transparent. For those of you who grew up with Legos, you remember the transparent pieces were usually the coolest and this jet will help to reinforce that truth. The converse side of things is that while kids’ toys are usually very simple in their appearance, they’re very rugged in their design and construction. 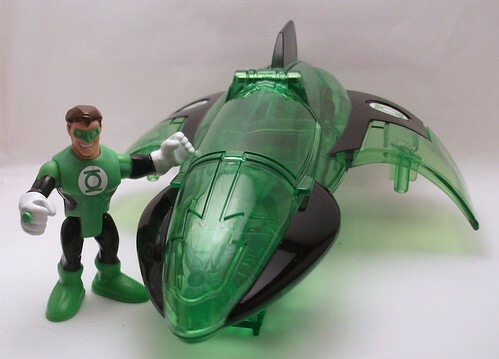 The Green Lantern action figure and his jet are no different. A very sturdy plastic is used in both of these and nothing short of an intentional and willful desire to destroy them would visit anything but passing wear-and-tear on these toys. Again, like appearance, these toys are intentionally designed to lack any meaningful ambulatory abilities. Still, there are some notes to point out. The shoulder joints of the Green Lantern figure are ball-joints, allowing for a full range of arm motions, and not merely the liner joints like the hips. It is unfortunate that the legs are a single unit (meaning that lifting the left leg means the right leg follows). The neck joint allows rotation but nothing else. The jet has only two moving parts (not including the firing mechanism for the missile launcher): the canopy and the trigger on the back of the jet that does…nothing. Well, it does something. There are two little plastic turbines in the back of the jet that move. For some reason. It’s not entirely clear what they’re supposed to be, except maybe to give the appearance of flight. You can see the mechanisms that turn the turbines, which a Seven-year-old might find fascinating. But this novelty serves no purpose to play. The jet comes with three missiles, all of which attach (one loads into the firing mechanism and the other two attach to either wing). Unfortunately, that’s about it. The Green Lantern figure has hands that can hold accessories from other toys in the DC Superheroes line, but he doesn’t come with any himself. Again, this is probably a conscious decision to avoid choking hazards and similar concerns. The packaging is about as generic as they come. It’s an open-air package with the figure behind plastic and the vehicle strapped down to the cardboard box. The back has the generic picture all toys in the line carry, giving a pretty small composite shot of all the toys in the line, and it offers no explanation to whom the Green Lantern is, why he has a jet, or why he and Batman are friends. This is a hard toy to score because it’s quite obvious that the target audience for it is of a very young age. It ranked a two but a strong case could be made for a three. Details and accessories are eschewed for a remarkable – but not unheard of – durability, while an overall generic aesthetic is sought. Still, this is a fun toy to play with and for the younger audiences, it will likely stand out. And again, for those parents looking to introduce their young children to comic book heroes, these kinds of toys will do a fantastic job. Plus, the jet’s see-through green plastic. And that’s just cool.